Baker’s Pride has combined enhanced microwave power with top and bottom air impingement to produce menu flexibility and speedy cooking within a small footprint! 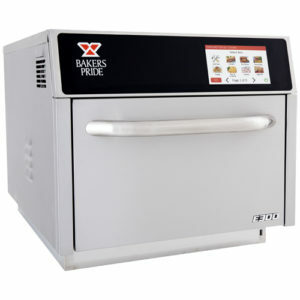 The Baker’s Pride E300 Hearthbake Series allows operators to cook, reheat, bake, or brown any combination of proteins, vegetables, or baked goods, and does it all with impressive results. Operators can program up to 384 recipes with six cooking steps each within the easy-to-navigate touchscreen display, or simply update menus and firmware via a USB port. Cleanup is a breeze with removable jet plates and smooth, all-stainless surfaces throughout the unit.